The Night Star is the ultimate in luxury semi-truck mattress. It has a 2 ½- inch layer of memory foam on top of a 5 ½-inch base of our premium high density and resiliency polyurethane foam. Custom sizes and cut corners are always available. If you want a great quality truck mattress at factory prices that’s super comfortable and delivered fast—this is your mattress! The Night Star model is made with a 5 ½-inch base of our premium high density and resilient polyurethane foam bonded to a 2 ½-inch layer of plush memory foam on top. If you’re a trucker looking for the ultimate in luxury and comfort, the Night Star is the perfect truck bed mattress for your sleeper cab. Because memory foam alone doesn’t provide sufficient sleep support, our engineers have backed up all of our memory foam mattresses with a superior base of urethane foam. This precision laminated truck mattress provides a perfect sleeping surface at 8-inches, melding proper support with the luxurious feel of memory foam. No matter what size mattress you’re looking for, this semi-truck mattress will give that “plusher” feel you’re looking for. The Night Star premium cover is constructed so it won’t shift on its bed base. The bottom of the cover is made from the same high-tech, non-skid material as our “Cross Country” and “Roadside” models, and the sides and sleeping surface are sewn with a tape edge using an eye-pleasing, premium, quilted damask. Whether your packing it in for the night, or taking a well-deserved rest, this truck sleeper mattress has the “ahhh” factor you’re looking for. 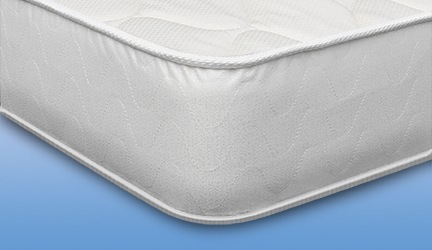 Optimal Support—Our premium Night Star mattress can hold over 250 lbs. without ever bottoming out. 8-Inches Thick—Combines a 5.5-inch base of 1.8 density support foam with a 2.5-inch memory foam for comfort: the perfect mix of soft on top and support underneath. 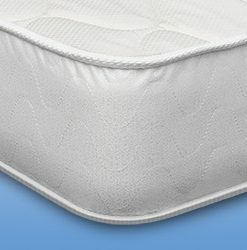 “Plush” and “Contouring” Top Feel!—If you love a plush top feel, take a good look at our Night Star mattress model, it offers our plushest top feel while providing great support underneath. Hardwearing and Long Lasting—We engineered this truck mattress with the most demanding truckers in mind. 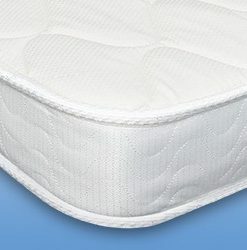 A heavy-duty cover (mattress ticking), durable foam core (1.8 high density foam below a luxurious layer of memory foam), and “old school” manufacturing techniques help the Night Star to have the kind of durability you want in a mattress. We take the extra time and effort to carefully sew all our seams—and we never use zippers! Made in the U.S.A.—The Night Star is custom crafted in our NJ manufacturing facility in about a week, often less. Delivery is fast and shipping is free. Made to Accommodate Multiple Truck Manufacturers—Our memory foam truck bed mattress fits perfectly in Freightliner, Kenworth, Volvo, Peterbilt, Sterling, Ford, Mack, Western Star, or any other truck brand.